Funnily enough, since our last round-up, Weibo got a huge boost in Western media when BuzzFeed writer Matt Stopera blogged out about how Chinese netizens helped him find the man who ended up with his stolen iPhone. The story is pretty long, but it’s a good read for anyone who likes a dose of bromance. C: Everything else in this round-up seems pretty tame in comparison. Kimi Qiao with a giant bear! He and Cruel Romance costar Huang Xiaoming recently showed up on Happy Camp, which ended up being one of the highest-rated episodes in recent years. You can also catch him romancing actress Xu Lu in the upcoming reality show, We Are in Love (我们相爱吧), a.k.a. the Chinese version of We Got Married. Benefits are here! Sending you all… a little devil [literally, a bear child]. 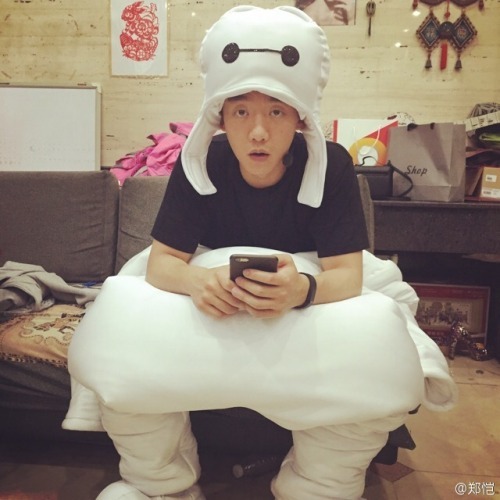 Zheng Kai is secretly everyone’s favorite Baymax from Big Hero 6. (●––●) He has a college-graduation movie with Michelle Chen coming out at the end of the month, titled Young For You (年少轻狂), which aims to break away from other similarly themed “youth” movies. Actress-director Xu Jinglei shows off a dress of her own creation. Looks better than anything I could make, that’s for sure. First self-created dress in my life! In any case, I got it created!! Although it’s a little coarse… please call me talented! 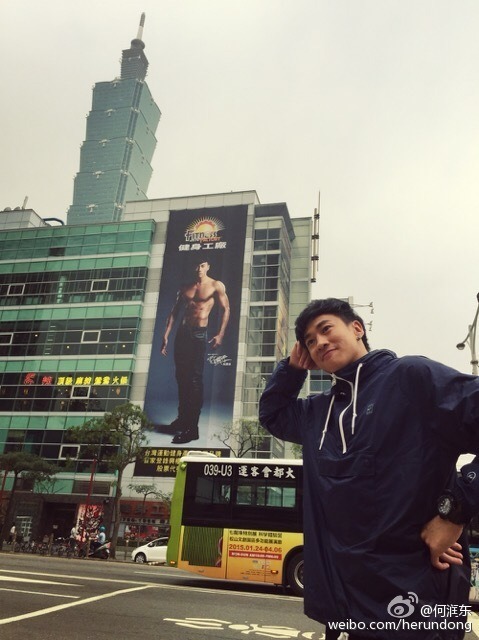 Peter Ho did some hilarious poses with a shirtless advertisement of himself in Taipei. He’s currently in Shenzhen filming the drama Beautiful Secret (美丽的秘密) with Victoria Song of f(x). Why are you here?! Is he here to collect bodyguard fees? The Four (少年四大名捕) actor William Chan brought out proof that he is a certified lady killer. I don’t think that’s going to win you any brownie points with Zhao Liying‘s dad in The Legend of Zu (蜀山战记之剑侠传奇), my dear. Wang Leehom gets creative with his exercising. He and wife Lee Jinglei were recently spotted vacationing in Japan. Exercising method I came up with myself. Do you all have one too? Tian Liang shared a funny story about his daughter, Cindy Tian Yucheng, and her devious way of getting her little brother to drink his medicine. Sister and brother always catch the cold at the same time. It’s always been harder getting younger brother to take his medicine, and he didn’t even want to drink this time when his sister was with him. She said, “I always get better after taking medicine and going to sleep. Are you going to drink or not?” He shook his head. Then she said, “If you don’t drink it, then I’ll drink it, and when I get better, Daddy and I will go out and play tomorrow. You don’t want to go?” Younger brother grabbed the medicine and drank it up, and almost drank his sister’s as well. And last but not least, on April 7, hurdler Liu Xiang announced his retirement with an essay looking back at his 19 years as an athlete. At 31 years old, he plans to finish up his education, as well as help out in advancing national health and the physical education of Chinese youth. Best of luck to him and his future endeavors! 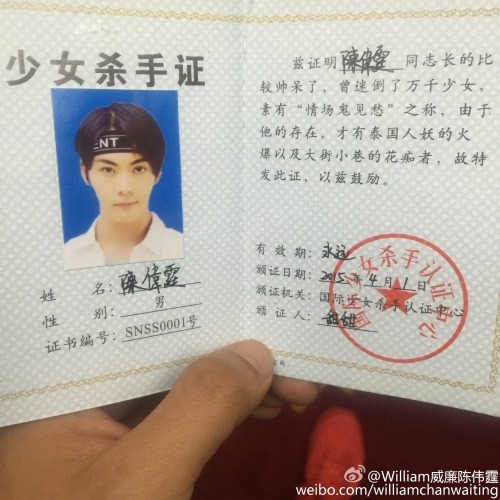 This entry was posted in Miscellaneous and tagged Beautiful Secret, Cindy Tian Yucheng, Kimi Qiao, Liu Xiang, Peter Ho, Tian Liang, Wang Leehom, We Are in Love, Weibo Wednesday, William Chan, Xu Jinglei, Young For You, Zheng Kai by Jo. Bookmark the permalink. How much do you want to be Kimi’s going to get Xu Lu a teddy bear at some point? 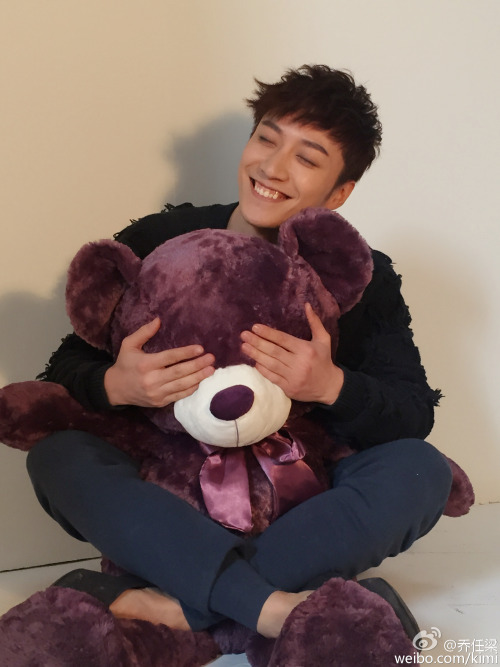 He seems to have an overabundance of giant teddy bears. Wang Leehom's board(wall?) looks like it's going to fall off any point.